WASHINGTON: A powerful 8.0 magnitude earthquake generated Pacific tsunami on Wednesday, killing an unknown number of people in American and Western Samoa and sending others fleeing for higher ground, officials said. An official of the US National Park Service said there had been deaths in American Samoa, but there was no word on how many. Similarly, a local police spokeswoman in nearby Western Samoa said the tsunami had killed an unknown number of people there. "I can confirm there is damage, I can confirm there are deaths and I can confirm there are casualties," the police spokeswoman said by phone. "I cannot say any more at the moment." A tsunami was observed at Apia, Western Samoa, and at Pago Pago, American Samoa, according to the West Coast/Alaska Tsunami Warning Center, a branch of the US National Oceanic and Atmospheric Administration. The waves at Pago Pago were 5.1 feet (1.57 metres) above normal sea level, according to the Pacific Western Tsunami Warning Center in Hawaii. The center earlier issued a tsunami warning for New Zealand, American Samoa and other small Pacific islands. American Samoa is a tiny US territory that lies about halfway between Hawaii and New Zealand. It is home to about 65,000 people. Holly Bundock, spokeswoman for the National Park Service's Pacific West Region in Oakland California, said "I would say we're alarmed," adding the service had heard from Mike Reynolds, superintendent of the National Park of American Samoa. Reynolds told a Yellowstone dispatch operator that four tsunami waves, each 15 (4.6 metres) to 20 feet (6 metres) high, reaching half-mile (0.8 km) to mile (1.6 miles) inland on island of Tutuila, where Pago Pago is. "The National Park of American Samoa visitor center and its offices appear to be destroyed completely," Bundock said. Reynolds reported deaths but had no confirmation of numbers, she said. "He's completely cut off from the rest of the island," Bundock said. In the island nation of Western Samoa, some residents told Radio New Zealand they had felt a big jolt and were recommended by authorities to move to higher ground. "Sea level readings indicate a tsunami was generated. It may have been destructive along coasts near the earthquake epicenter and could also be a threat to more distant coasts," the Pacific warning center said. Nathan Becker, an official at the center, told MSNBC a tsunami wave can dissipate or grow larger and go all the way across the ocean. "This is why we've issued a warning for a wide area," he said. 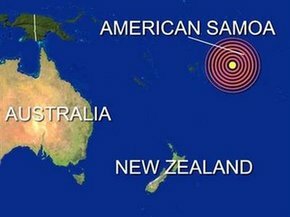 The epicenter of the quake was located 120 miles (190 km) southwest of American Samoa, a remote Pacific island, the US Geological Survey. The USGS earlier said the quake measured 7.9 magnitude. It struck at a depth of 11.2 miles (18 km). Hawaii was monitoring the situation. CNN said that if a tsunami hit Hawaii, it would arrive at at about 7:18 EDT (2318 GMT). Chevron Corp said it was monitoring the tsunami threat to Hawaii, where the company has a 54,000 barrel per day (bpd) refinery near Honolulu. "We are currently monitoring the situation via updates provided by local authorities," said Chevron spokesman Sean Comey." Tesoro Corp did not immediately reply to messages about its 93,500 bpd refinery at Ewa Beach, also on the Hawaiian island of Oahu. Both refineries provide jet fuel to commercial airlines and the US military complex at Pearl Harbor as well motor fuels.